Viewing 2 current events matching “hackathon” by Date. Viewing 139 past events matching “hackathon” by Date. Join a few Ruby programmers for dinner to explore alternatives to fixtures for use in tests. 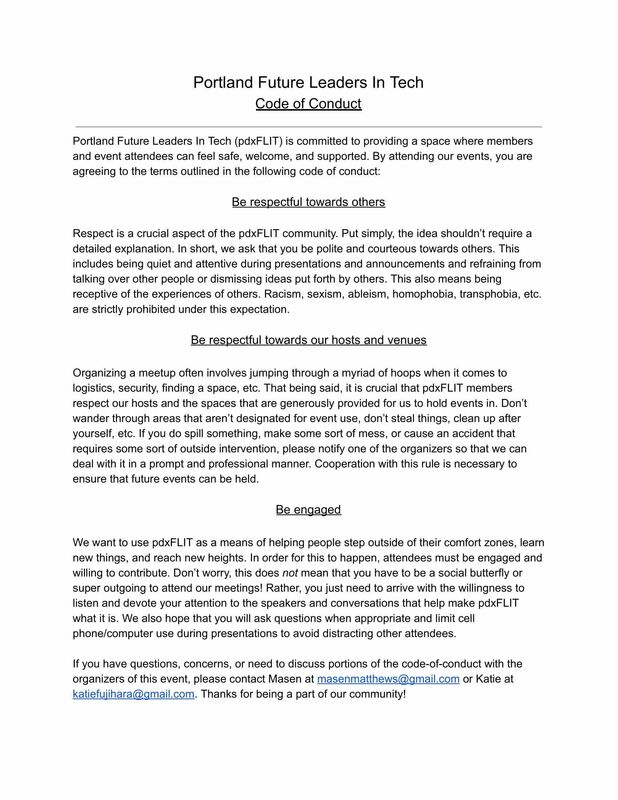 We'd like to co-present our findings at the next pdxruby meeting. We can use existing open source Ruby software to experiment with, by making a branch, trying out the library, and requesting a merge if we like the changes. Apps we can contribute to include http://calagator.org , http://openconferenceware.org and http://pdxruby.org. At this monthly meeting, we get together, talk about app ideas for one or two industry (such as sporting apparel, commercial building, food, water, etc). These are the local industry that can use some help to identify solutions to reduce carbon footprint and lessen any negative environmental impact to local residents. Our goal is to brainstorm innovative ideas utilizing information technology by leveraging the mobile and social web. Of course, creative juice often comes after a glass of nice brew. That's how drink is involved in this. If you not a drinker, the Pub serves good food of you to hack & eat. We are not really building an app at the meeting (but if you would like to crank out an app in 90 mins, that would be awesome too). And what are we doing with these ideas? You'll have to come to find out. For those who won't be able to make it in person you can join via G+ Hangout. Please let me know in advance. Thanks and hope to see you on the 15th! 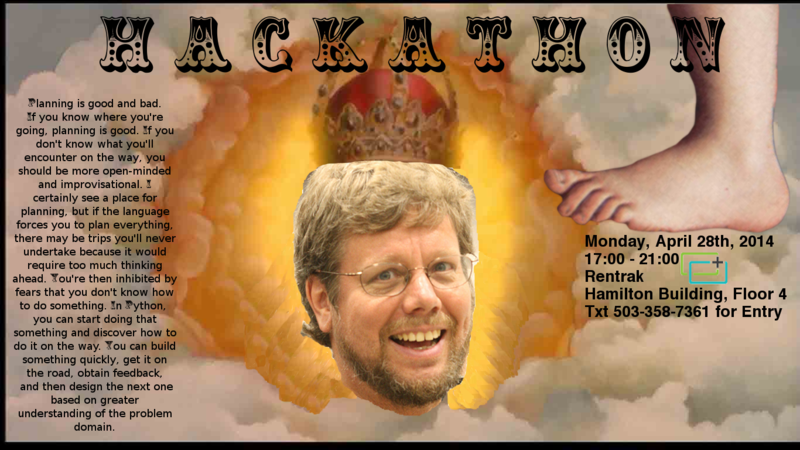 Everyone is welcome to attend the hackathon! Whether you're coming to the conference or just local, whether you're an existing committer or not, whether you're a coder or a writer or a designer or a tester, you'll all have a chance to get involved! UPDATE: Due to several people on our team being out of town, we've had to postpone this event until later this year. We'll be sure to add it to calagator when we pick a new date! We're throwing a big hackathon to showcase a bunch of new Esri tools! Come be some of the first to check out new and improved documentation, user interface and new SDKs and APIs for Esri's core technology. New to Esri? Basically, you can do anything add any kind of geo-functionality any product or app you're working on. From maps and data, geocoding and routing, demographic data and more, you'll be able to check out and test work from Esri R&D Center Portland and Esri HQ in Redlands! There will be plenty of free food and drink, and networking kickoff the night before. Teams will have Friday night until 6pm Sunday to build apps using Esri technology. We'll have sample code on Github and a ton of example projects. There will also be plenty of Esri devs on site to help out. Feel free to participate if you're a designer or developer, college student, professional, high school student or someone just interested in geo. Keep in mind that this is a developer hackathon, so you should arrive with at least some knowledge of HTML/CSS so that you can contribute to a team. If you don't know HTML/CSS but are a skilled graphic designer, we need you too! Think of it as a playground for trying new things out. What kind of prizes will there be? Prizes will be announced soon, but suffice it to say they will likely be interesting objects that fly through the air. Also, free conference tickets and Esri software credits for runner ups. Join web and mobile experts on Sun., May 19th at the Portland Hackathon for Social Good. 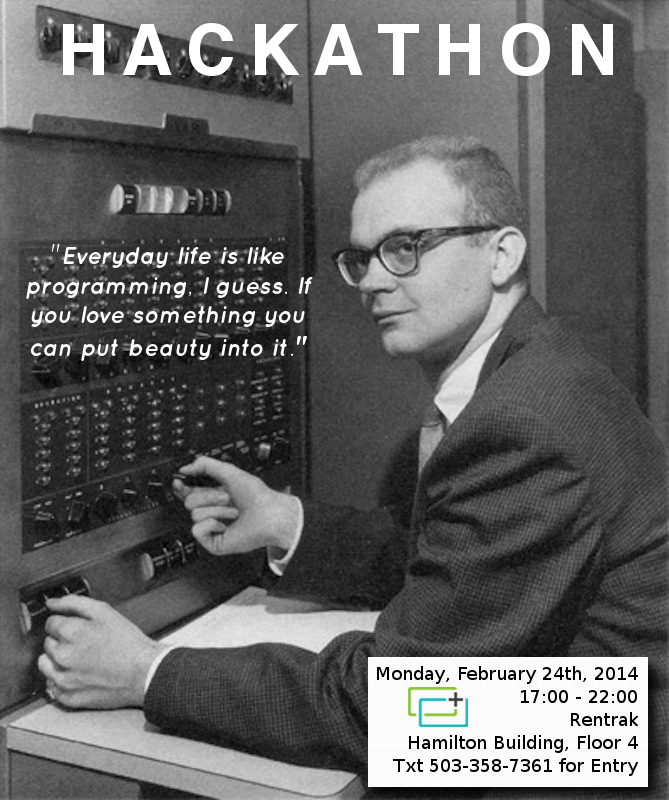 Hackathons are events when programmers and designers meet to work collaboratively to build programs and applications. The day will begin with short presentations by educators and non-profit organizations, followed by informational sessions on building sites and web applications to help benefit non-profit organizations: The Dalai Lama Center, Dress for Success, Habitat for Humanity (Re)Store and Compassion & Choices. "The White House wants you to hack for a better America. Today it announced the National Day Of Civic Hacking on June 1-2 where many government agencies will liberate data for citizens across the U.S. to use to build tech that helps their communities. Twenty-seven cities have planned events where hackers will have access to data from The Department of Labor, The Census Bureau, and even NASA’s space stats. The National Day Of Civic Hacking is a joint project from the U.S. government, Code For America, Random Hacks Of Kindness, and Eric Schmidt’s early-stage venture fund Innovation Endeavors. Part of a growing initiative to increase government transparency and civic engagement,..."
Pitch ideas, form teams, and build something amazing in 24 hours. What should I bring? Bring anything that you think will make yourself productive. You definitely need a laptop, but anything beyond that is up to you! Are we expected to sleep? The venue will be open overnight, but you can choose to sleep or keep working overnight! Please bring a pillow or sleeping bag if you feel that will make you more comfortable. Are there any age requirements? No, the event is open to all currently enrolled students. What languages can we use? There are no restrictions to what tools you can use (other than a few intended to prevent cheating, check the rules). If you use a language which few people know, you will have more difficulty getting help. Can I go even if I don't know anything? Of course! Part of the fun of a hackathon is figuring out things as you go along. We'll also have some great workshops that you can attend. Or just hang out and have fun! How big are the teams? We suggest 3-6 people per team. 8 is the absolute max. You can be a team of 1. Can I be on multiple teams? Yes. Do I need a group to attend? We'll be forming teams at the event, so you don't need to know anyone beforehand. Just show up! Is it possible to make an app or game in such a short time? Yes! We're constantly amazed by the results of CodeDay events! Check out S.S. Halfling, and Running Blind, both games led by students at Redmond HS in Washington. Are there any more official rules? Check out The Official Rules. The National Day of Civic Hacking is a nationwide event to build innovative civic projects and a lasting community that is passionate about finding technological solutions to shared problems in our communities. 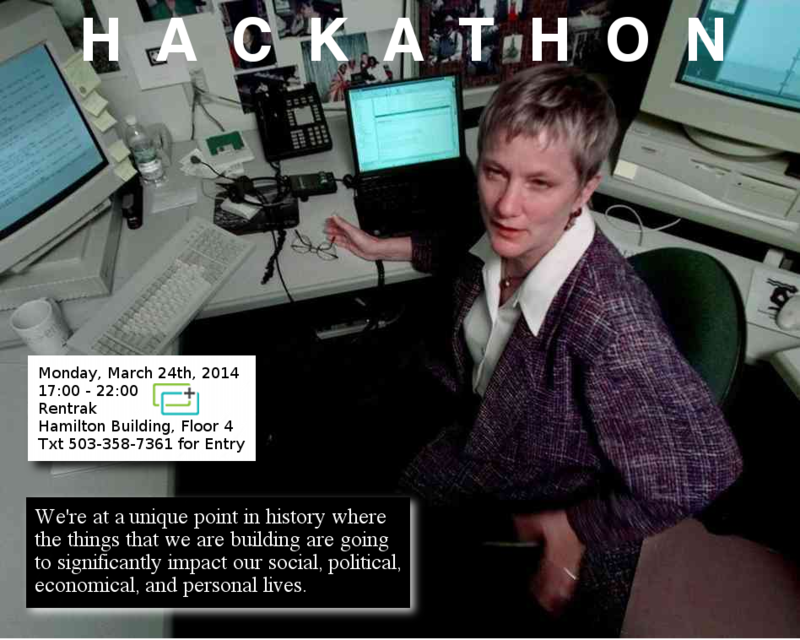 Portland is hosting two Civic Hack-a-thons in celebration of this national day. Join us for a joint kick-off event to celebrate, get inspired, and hear more about each hack-a-thon. There’s all kinds of dreaming, creating, and hacking you can be part of! RSVP + join fellow Portlanders (whether you live here or are passing through) for a brief weekend of making something awesome. We'll be kicking off at Ford Food and Drink, though don't expect to find us holed up there all day and night as we'll be breaking into teams before the hackathon proper kicks off at 1pm. [Check the event site for full schedule.] Come by at 10:30 for social hour to meet your fellow dreamers, developers and designers followed by pitches - after which we'll break out into teams and get to making. The top 3 winners world-wide get interviews with 500 Startups, Techstars, and office hours with YC partner and founder of Reddit, Alexis Ohanian! On top of that, the grand prize winner will win a chance to get in front of Andreessen Horowitz to discuss your startup or product! The Community Cycling Center with Code for Portland is building a tool to make transportation advocacy accessible to people from all backgrounds - dewonkifying the wonkery of city budgets, citizen reporting, and community meetings. The hackathon will involve updating and implementing the key features of the Avenues to Advocacy civic engagement tool - anyone that's interested in transportation planning, biking, walking, map technology, government data, or increasing access to transportation advocacy is welcome to join. (No tech experience necessary, there's roles for everyone.) Snacks, coffee, and lunch provided with ticket. Tickets are free, just RSVP using the eventbrite link. You're from the City of Roses and Transportation Awareness and, geez, do you have ideas about how to improve things!! Here's a chance to hack solutions to your biggest transportation problems using the latest connected hardware from Intel -- the Intel® IoT Hackathon: Transportation! Exceptional projects will be awarded great prizes after judging on Sunday 12/7. Attendees also are eligible for other prizes throughout the event. *There are only 50 spots available, reserve your spot before it’s too late!!! Startup Weekend B2B is a 54 hour event where developers, designers, marketers and other startup enthusiasts come together to pitch their business-to-business startup ideas, form teams, build products, and launch their revenue generating startup. We're back! 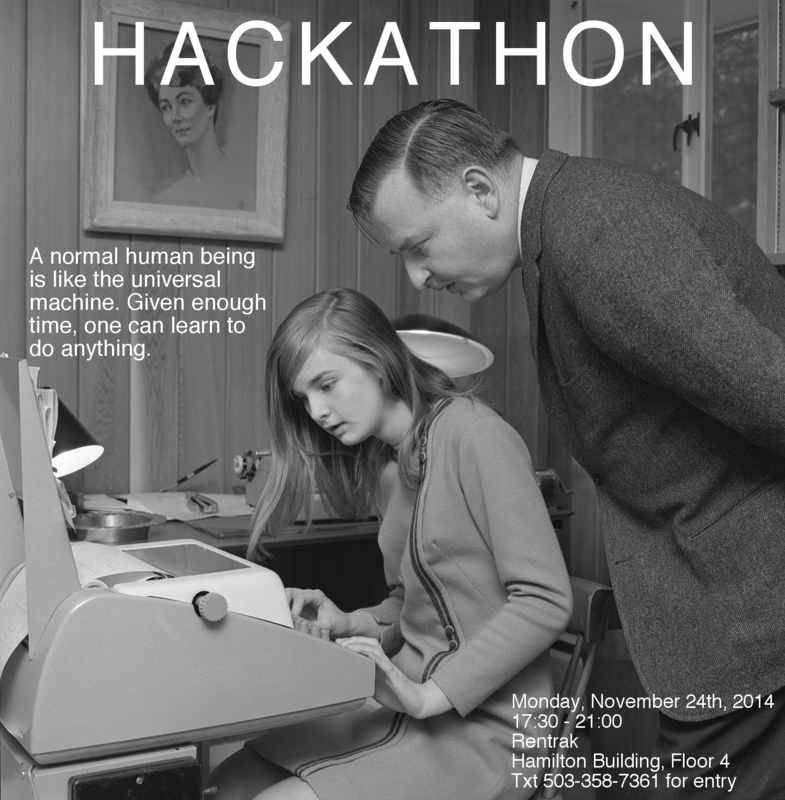 Join us for the Winter 2015 Hackathon at Airbnb Portland! The theme is education, but feel free to hack on something PDX related or anything at all. There will be food for everyone and prizes for the best hacks, so come with a team, make one here, or fly solo to gain everlasting fame as the creator of the next Instagram for IOT BigData SoMoLo Toasters. Please RSVP on Eventbrite if you're planning on attending; space is limited and you must be on the list to get in! Nike and Puppet are collaborating to host the 2nd We Code Hackathon for women and friends. Web designers and developers of all levels are invited to work on a fun project in small teams at this creative and collaborative coding event. You’ll have an opportunity to meet and work with other talented people, develop your skills, and create new applications. T-shirts, prizes, and great food from local restaurants will be provided. Learn more and RSVP at: https://wecode-nov2016s.splashthat.com. Learn, Network, Startup In just 54 hours, you will experience the highs, lows, fun, and pressure that make up life at a startup. As you learn how to create a real company, you'll meet the very best mentors, investors, co-founders, and sponsors who are ready to help you get started. Your community is here to help you — find an event today! Sep 21, 2018 Hack the Dot! Hack the Dot is a hackathon where code school students, working developers, marketing and design professionals, and anyone else interested in the Web come together to build ideas. Use your skills in web development, storytelling, and creative ideation to build a humorous (maybe even functional!) product, while meeting people in your tech/startup community. This quarter we're teaming up with pdxFLIT and Puppet Labs. Join us! At a domain-driven hackathon, all of the teams are given a single premium domain name at the beginning of the event. All teams then have two hours to come up with a product inspired by that domain, fueled by food and beverage. Whichever team builds and pitches the most creative and funny idea for the domain wins! 6:15 - MC introductions, reveal the night's domain name! Do you have a Code of Conduct for this event? We sure do! Make sure you read and agree before signing up! Nov 3, 2018 Alchemy's 2018FreeCodeCamp.org JAMStack Hackathon PDX Edition! Join us for the We Code Hackathon for Women and Friends! This is the 4th Annual Hackathon hosted by Nike and Puppet and we're excited to help our non-profit partners address challenges with technical solutions.